In an experiment that could lead to improved heat shield designs for future spacecraft - along with insights into shuttle aerodynamics - temperature data and infrared imagery confirm a modified tile on the underside of the shuttle Discovery's left wing caused air rushing over the belly of the orbiter to transition from smooth to turbulent flow as expected. The goal of the research is to gain a better understanding of how smooth, laminar airflow, which provides a thin layer of insulation during peak heating, can change to the disturbed, turbulent flow that can cause downstream temperatures to climb, possibly affecting aerodynamics and causing damage. That change is known as a boundary layer transition. 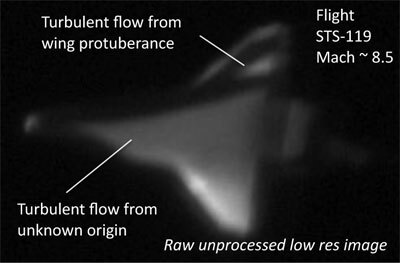 The shuttle's transition from laminar to turbulent flow occurs naturally as the spacecraft slows down, typically at velocities around mach 8, or eight times the speed of sound, about 20 minutes after atmospheric entry begins. In some cases, however, the transition can occur earlier than that because of surface roughness or defects in the heat shield. For example, a protruding tile spacer called a "gap filler" can shake loose during launch and extend up into the airflow, triggering an early, asymmetric boundary layer transition during re-entry. When that happens, the shuttle's aerodynamics can be affected and downstream tiles can be subjected to more extreme heating. During shuttle mission STS-28 in 1989, for example, the boundary layer "tripped" 15 minutes after entry, at around mach 18. During shuttle mission STS-50 in 1992, one side of the shuttle's belly went turbulent more than a minute ahead of the other side, causing a change in aerodynamics that prompted autopilot flight control inputs. For Discovery's boundary layer transition - BLT - experiment, a single tile on the bottom of the shuttle's left wing, about 10 feet behind the leading edge, featured a 0.25-inch-high ridge that was expected to cause the insulating boundary layer downstream to go turbulent between mach 12 and 14. That, in turn, was expected to raise the temperatures of downstream tiles by 500 to 600 degrees Fahrenheit. The tiles in that region of the wing normally experience maximum temperatures of 1,500 to 1,600 degrees when the re-entry airflow across the wing is smooth. Preliminary reports indicated the maximum temperature experienced by the "protuberance tile" was around 2,000 degrees, somewhat less than expected. If those measurements are confirmed, engineers may request a slightly higher protuberance for a future flight. 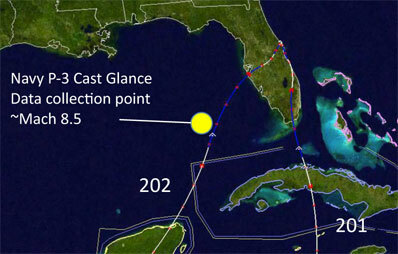 Along with temperature data, a Navy P-3 Orion aircraft flying over the Gulf of Mexico southwest of Tampa captured infrared images of the shuttle's belly when the orbiter had slowed to about 8.5 times the speed of sound. A wedge of higher heating downstream of the protuberance tile was clearly visible in the unprocessed, raw imagery, along with a broader zone of turbulence. It was not immediately known if the broader zone of turbulence seen in the P-3 image reflected a normal or asymmetric transition to turbulent flow, either on-time or earlier than expected. But an engineer familiar with boundary layer issues said the image likely reflected a "typical" shuttle boundary layer transition. Engineers reported the protuberance tile looked normal and undamaged on the runway after Discovery's landing, although superficial markings were seen on several downstream tiles. No such markings were seen on tiles behind a protruding gap filler that was spotted during an on-orbit inspection on one of Discovery's elevons. For additional details about the BLT experiment, please see our earlier story.